Sad day in rocket land. Rockets are energetic devices. They are dangerous. No one working on them should ever forget that. Nor should we shy from the task at hand. Very often in human history progress has been paid for in blood. So it has been and so it always will be. Our heartfelt condolences go out to the entire scaled family. Its all about the systems integration. I'm trying to diagnose the Helicopter systems to work on flight software. I have a GPS on the roof of my house and one mounted on the back of the helicopter, when working on the system I unplug the one on the helicopter and plug in the one on the roof We get ZERO gps reception inside. The one on the roof works really well. So I take the helicopter out to fly it and after waiting a long time get no GPS lock at all. So I bring it back to the house and replace the GPS receiver with another one. (assuming the old GPS receiver got broken in the last heli cras h.) ,butI'm getting smarter I don't drive all the way to the flying field to test the new receiver. I go out in the back yard still no GPS. So now I take a 6 foot cable and the "broken" gps and plug it into the helicopter it works from 6 feet away! So I then set the broken GPS on top of the gps on the helicopter and it still works! Then I remove the 6 foot cable and it does not work. So I now have 2 GPS receivers that have decided that they need 6 feet of cable to operate. 1 foot is not enough. First working hypothesis: the 900Mhz telemetry radio is putting EMI on the wiring. The long cable is enough to filter it out, the short cable is not. Experimental test don't transmit until you get GPS lock. Still no GPS, add 6foot cable to verify the don't transmit till you get lock code works, the code works. Some other component of the system (likely the CPU) is putting enough noise on the wire to kill the GPS, Next step put noise filter on all the cables and try again. 1)Make the system fly on a Trex 600 RC helicopter. 2)Move all but the lowest level rate command servo loops from the helicopter to the rocket. Toward that end we have been using a nice RC heli sim from source forge to simulate the helicopter systems in software. We have modified the sim to only update the data at the same rate as our IMU and GPS. The windows version of the simulator does not have any kind of control or autopilot, just a comment in the code that says put your control laws here.... Using that I've tuned the insane number of PID loops and adjusted it so it will fly a whole XPC LLC flight from start to finish. (You can run my compiled version of the code here) Again this is an exe that is compiled for my use etc etc . The helicopter with GPS, IMU and computer mounted on it. The test stand we have been running. Not awesome video and if you have not been following the blog it probably won't make sense, but my guess is that people like to see hardware from time to time. No show stoppers in paperwork land. This last week I had to provide XPC a Mishap response plan. I think such plans should be really simple so that you can actually do them in time of crisis. The document is here. 1)The motor started correctly. This was the result of using a lox lead and pre-flowing the igniter for a few seconds. 2)We did a number of throttle step tests with the new fast butterfly valves. 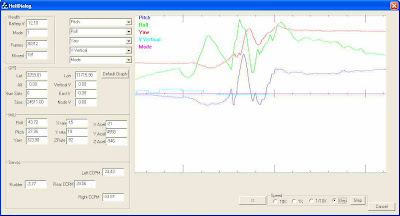 From the gathered data we were only really throttling the fuel side, but the response time and the fact that the motor ran down to 75 PSI input pressure was really good news. We are planning to do a test fire again this Saturday. We have made a number of changes. We have added very very fast butterfly valves just after the main (slow) ball valves. We hope this will have a bit more linear throttle action and be somewhat faster. Toward that end we have set up a flow test with an exact engine string, pressure transducer, ball valve, butterfly valve , pressure transducer,turbine flow meter , long tube and pintile orifice. We have started mapping how linear the valve is and it's flow response. This will all be on the test stand before Friday. In addition I found some very small isolated thermocouples and we will instrument the fuel temperature rise for this event. So this weeks fireeing should generate some good data. I always planned to have the thermocouple, but the non-isolated version had some ground loop problems that totally swamped the signal I was trying to measure. On the stability and control front I upgraded my helicopter from a Trex 450 to a Trex 600, it no longer wallows with the IMU, GPS and computer attached. We will report more on this effort next week. Due to some scheduling issues we will not be testing this comming weekend, but we will be testing the weekend of the 14th. Since the airlander flight testing did not go so well I thought I'd sneak up on the problem. I took my IMU, CPU, Telemetry radio and GPS and weighed it. I then took that much lead and put it on my Trex 450 RC helicopter. It's a small helicopter as RC helicopters go and I wanted to see if it could carry that much weight. So with 290 grams of lead it flew just fine, hovered for close to 5 minutes. Step 2 Actually mount all that stuff to the helicopter and see if all works. So I mounted the GPS, IMU, Telemetry Radio to the Helicopter. I then took the outputs from the RC receiver to the CPU board and then ran the helicopter servos from the CPU. The CPU is in the loop, but not yet doing anything but passing the commands directly from the RC receiver. I added an additional input from the RC receiver that I call mode that will allow me to switch from manual contol to automated control as time goes on. The GPS, RC receiver and telemetry radio all seem to coexist with no detectable interference. I'll get the replacement parts on Friday and go to a large open field and start doing some serious testing this week end. I recorded the telemetry during this whole flight. 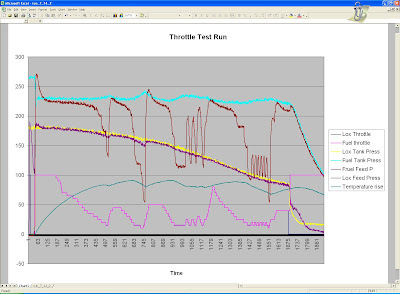 You can take a look at it I've uploaded the telemetry data file and the executable to view it. The executable is the same one that shows telemetry in real time so on startup you need to select the "replay log" button. Then load flight2.dat. The log file has a bit of dull data as I go from starting the recording to connecting the RC power battery and moving the helicopter into position. Liftoff is around frame 8000. You probably want to click the 10X button until data starts changing. The 5 combo boxes on top left control what data is displayed. The screen shot on the left is centered at the moment of shrub acquisition. The derived Roll, Pitch and Yaw seem really reasonable, the rates and accelerations seem really noisy. Enjoy following along.